Comments are a work in progress Mr. Knotts and will be a dinner discussion before the movie of the night “Assualt on Wall Street”. The ‘Problem?’ post Mr. Knotts has generated a rather interesting ongoing discussion around the House of Tuxamus Maximus in that the two more elderly residents raised young ones using the 1969 method and it seemed to work out well. Not quite as harsh as depicted but it was an ongoing effort and since college degrees were obtained and self esteem seems to be relatively good/intact Fred and Wilma are, for the most part, rather pleased by this method. As for the other side ’Today’ we can only write “WTF”? When did this start happening (we know it does) but more importantly WHY? Maybe it happened when we were parents but we weren’t aware of it being an issue. From the discussions around here (everyone has at least one college degree of one kind or another) this has been a growing pattern of parenting, and we use that term lightly. Is this what is part of the ‘helicoptering’ we’ve heard about? We knew it existed but not really until this cartoon was posted by Mr. Knotts did it ever become a real discussion between us but add the kids and it becomes interesting. Below you will read the thoughts of the four other current inhabitants of HTM and W & I hope you understand that the discussion is far from over around here! Sure do appreciate the word replace function in MS Word. Since we are requested to identify ourselves please consider me “TM Peebles”. My first time writing here. For a long time I envied the kids that had a parent or parents of today only because I grew up in a foster home. When I became friends in the 11th grade with adopted twins that had parents of the old school (1969) way my grades improved because I studied with them and had real friends. Looking back my foster parents did what they could and I lucked out. I stay in touch with both sets of parents I had and the twins as well but had it not been for the twins I don’t know where I’d be today. TM IT1 here and I have the ‘today’ parents. Even after being arrested for doing things with the schools computer systems I could do no wrong! Thought I was invincible until I got expelled and had to go to a private school. I’m here now and life is good doing what I’m here to do. Fred asks me if I would have wanted it to be different and all I can tell him and everyone is that it is what it is and aside from living in this house of fun I can’t change a thing. I’m not too fond of living in this area but I get away during off rotations and trade out when needed so I do the job and have the fun. I’m “TM IT4” and not much to say other than we had an in between mom concerning the cartoon. Sometimes she would be all over us and others all over the teachers. I didn’t care about grades other than I wanted to go to college because I didn’t want to work out of high school and if this job wasn’t so cool I’d be getting a masters degree building up more debt and barely working. If I’d been accepted into a masters program I wouldn’t be here and hope when the time comes I go back and get the masters. As TMJ I really don’t have much to offer the Mr. Knotts’ following aside from Laffter and Ms. Pandora. My dad (single parent) set rules and I had to study and have my homework done before anything else could happen. Dad never even got a diploma other than a GED and I’m the first in the family to have a college education, and a lot of debt but it’s getting paid off by being here. TMF back now stating that it’s an ongoing discussion at times around here. Although none really wrote all that they say around here we all know kids with the parents of ‘today’ and most are/were slackers (being nice using that word) and few made it through the first year of college in most cases…of those that went on to that level. 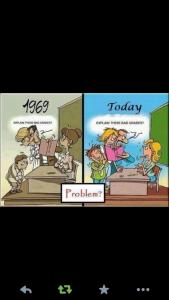 In my opinion it just goes to show that a lot of parents expect the teachers to do their job for them in the way of education and probably much more as well. Unfortunately most of the kids here also, as I’m sure many of us older adults know as well, knew families or single parents (which is too often the case) that it can be taken too far in the other direction as well. Maybe the others as they rotate in will have other thoughts to share but we all look forward to others joining in on this ‘Problem?’ because it is a problem that been growing over the years. 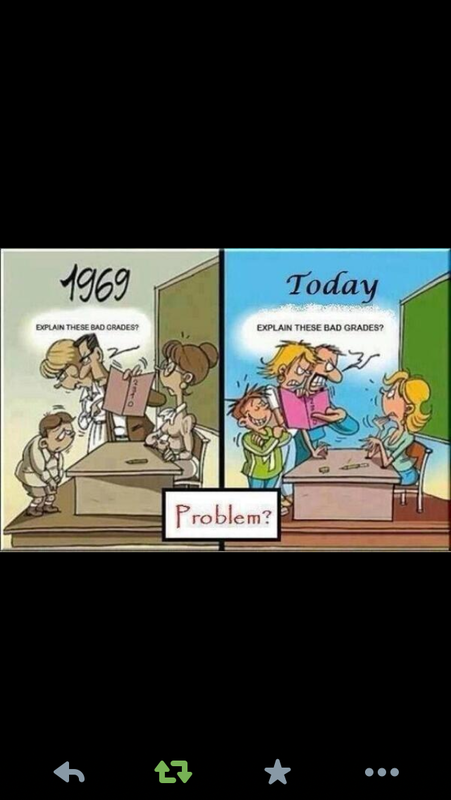 Our children have had HORRIBLE teachers, although they were in the extreme minority. These people violated every law and were mean, sleezy and nasty people, And when this happen the TODAY cartoon was applicable- and trust me, they knew it when they crossed the line and failed as a teacher. Luckily, the kids did well in school and continue to do so. If we want the education system to improve, then parents need to be involved more and on the flip side, bad teachers should be dumped. parents are the most important factor in the equation. you can experience success without supportive parents, but your odds of experiencing success increase dramatically with a loving parent(s). most teachers are pretty good, some are great, and some are horrible. ultimately, those who navigate their way knowing that it won’t be perfect are the most well educated and well adjusted. kids need to take their lumps sometimes (not be abused). kids who don’t take their lumps because their parents won’t let them are doomed. This is a fact. Engaged parents usually produce winners. And please, don’t fall for that ‘self-esteem’ crap- the demographic with the highest ‘self-esteem’ is criminals. Morality, honesty, effort and achievement build real self-esteem- little gold stars on a bulletin board signify nothing. Clearly Rick, you were never an educator of children. Morality, honesty effort and achievement and not produced in a vacuum, and beating it into children doesn’t produce much except more beaten children. Nurturing and coaching, with clear boundaries and limits on behaviour , with rewards ( gold starts on a chart) do produce positive results if those lessons are enforced and supported at home. What’s wrong- jealous of all those other kids that got gold stars? While you didn’t. Unless of course the cinimal is a sociopath or psychopath , which modern science is still not clear on whether those are nature- based or nurture – based flaws in the human psyche. Although, it is interesting to note that Wall Street corporate raiders and the corporate elite share the same make up of minerals and elements in their brains that sociopaths have, but they are not missing the element of cobalt . self esteem is real , but is too often used as an excuse. acknowledging that if you’ve had a rough go of it that you may suffer from it is a self fulfilling kind of thing. the message needs to be…”you can’t change where you came from, but you are in control of where you’re going.” sociopaths are the product of both nature and nurture. sometimes they are the result of a combination of the two. Clearly Rick, you were never an educator of children. That may be ‘clear’ to you, but you are wrong, as you usually are when you make baseless assumptions. Morality, honesty effort and achievement and not produced in a vacuum.. These traits are usually instilled by a family, and broken families often produce broken children. This is most obvious in the inner city. …and beating it into children doesn’t produce much except more beaten children. I’m sure you can quote from these ‘studies’ verbatim, but please provide a link to two or three of them. Thanks. Teaching degrees and teaching fads have destroyed what once was the best school system in the world- and international tests prove it. Thus, it is incumbent on every parent to augment your children’s education.